Our fabulous selection of luxury dog harnesses will keep your dog looking stylish whilst providing you with optimum control. Most of our luxury dog harnesses are handmade to order for us here in the UK by top designers including Mutts and Hounds. 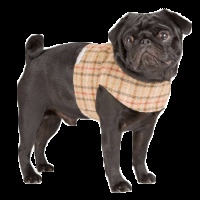 These include the very patriotic Union Jack print along with a selection of tweed dog harnesses. There is also a more simple yet still classic design of dog harness made out of very eco-friendly organic ticking fabric. Dog harnesses are a great way to walk your dog, they are comfortable for your dog to wear and they provide you with more control over your dog as apposed to the control you have when using a simple collar and lead. Our collection of stylish dog harnesses include the range from top designer Mutts and Hounds who’s dog harnesses are all handmade here in the UK using the finest materials including a selection of British fabrics by Emily Bond. At Chelsea Dogs, our dog harnesses come in a range of sizes to suit most breeds and they can be easily adjusted with Velcro fastenings.